Foot sealers are excellent for sealing various types of materials such as polycello, cellophane, polyethylene, aluminum foil coated bags and gusset bags. Foot heat sealers can increase the efficiency of sealing production by allowing the operator to work with both hands free to handle the product. 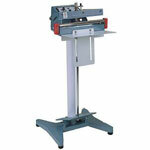 Foot sealers are generally used to seal larger width bags. The bag should be 2 inches smaller than the seal width of the sealer. 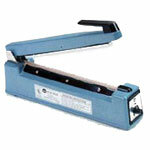 Impulse heat sealers work by briefly heating the bag along a strip. 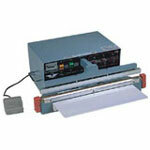 Foot sealers can effectively operate in moderate packaging environments. 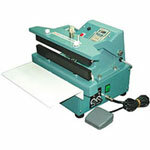 Boatman Marking has a vast selection of available impulse sealers and bag sealers for a variety of applications.